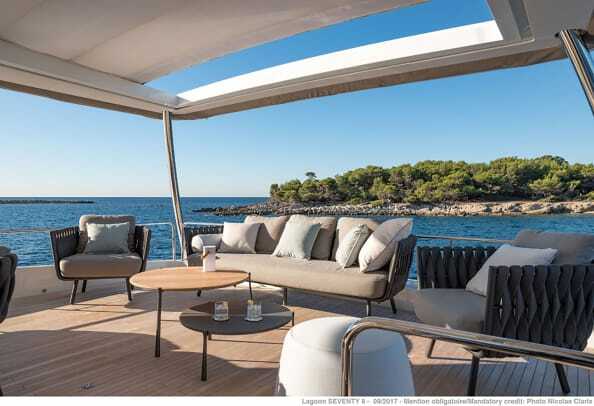 When I initally saw the Lagoon Seventy8 at the Cannes Yachting Festival in September I was floored, or should I say, decked. The enormous decks of this long-range cruising cat stretch across both the cockpit and bow, and along the length of the sponsons, each a huge expanse dotted with large hatches—five on the port side, seven to starboard—that provide light to the spaces below, as well as air and emergency egress. 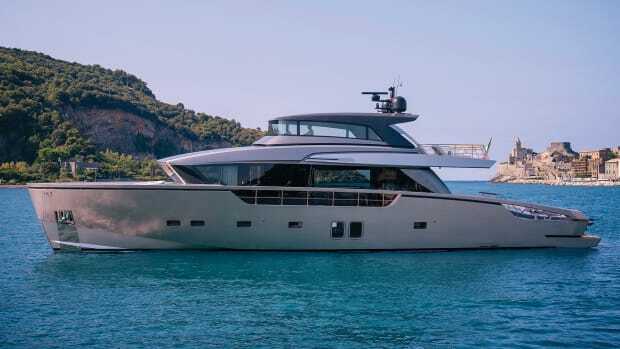 Thanks to the Seventy8’s large flybridge—with four available configurations, including one with a Jacuzzi—and a 322-square-foot bow deck, the company considers the onboard space to be comparable to a 115-foot monohull yacht. 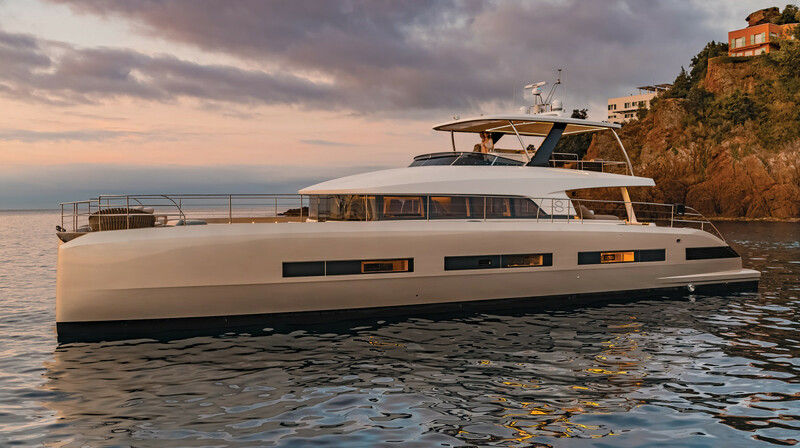 The spacious feel continued inside—this boat really is a claustrophobic’s dream—as I passed into the salon through the wide-opening aft doors to discover a large settee to starboard and dining table to port. 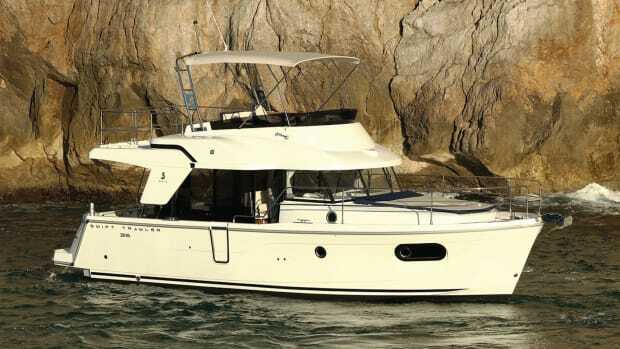 For a boat-show presentation on the wide flat-screen that dropped from the overhead, I sat on that settee with six other journalists, quite comfortably. I explored belowdecks looking over the arrangement of Hull No. 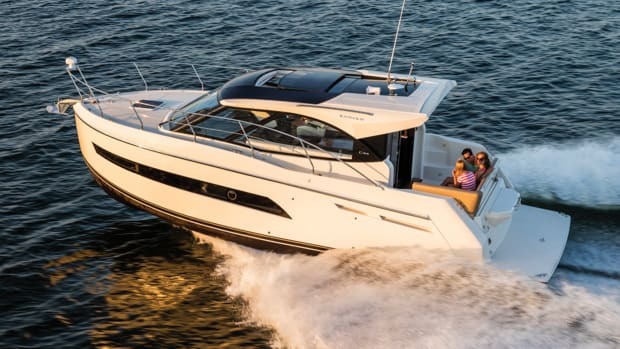 1, especially enjoying a visit to the owner’s cabin, which had a fold-down balcony called the “private beach option” for unparalleled views from the starboard hull. 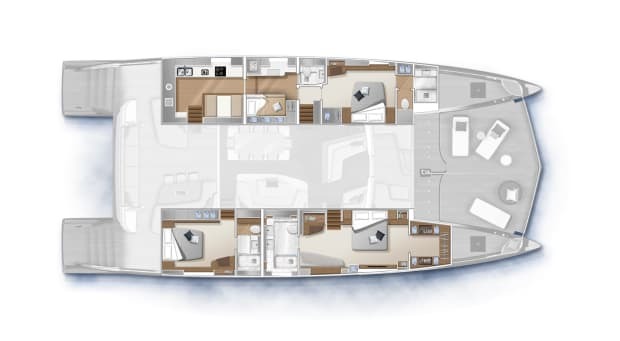 A variety of layouts are available, with up to four staterooms as well as quarters for up to six crew. I also visited the galley in the aft end of the port hull, where crew chef Marroussia Spence proffered a plate of coconut cookies. “Make them ahead and freeze the dough,” she said. “They come out moist that way.” She was right, of course. Have a closer look at the Lagoon Seventy8 in the gallery below. Photos by Nicolas Claris. 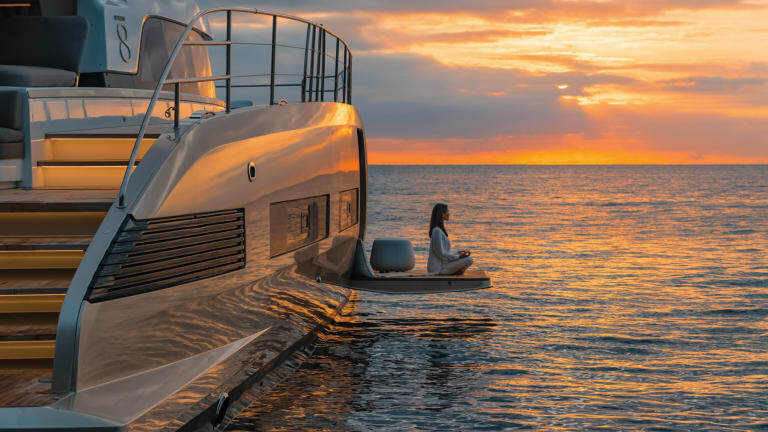 A brand of the Beneteau Group, Lagoon has made a name for itself building catamarans, but mostly those of the sailing variety, offering 11 models from 38 feet up to the Seventy7, which came out last year. 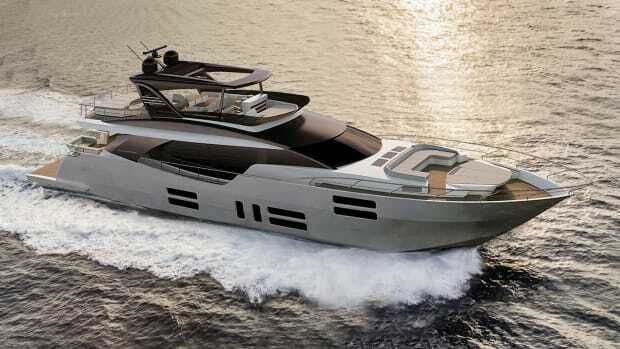 As for motoryachts, the Seventy8 is the second boat, following on the heels on the 630 that was launched in 2015. 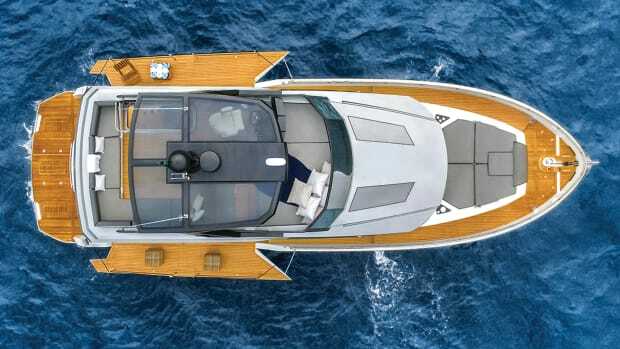 The Seventy8 shares a mold with the Seventy7, and the tooling has a removable tray at the stern end of each of the sponsons that allows the builder to make a different hull shape for the motoryacht or sailboat. 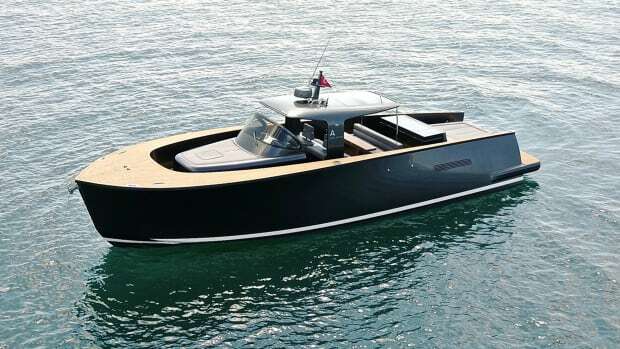 Both boats are built at Construction Navale Bordeaux, better known by its initials CNB, a French yacht builder that has been part of the Beneteau Group since 1992. The company has built a shed dedicated to this line and is aiming to build eight of the Seventy8s each year, a pace that speaks to the size of the build but also the company’s desire to preserve the quality level. 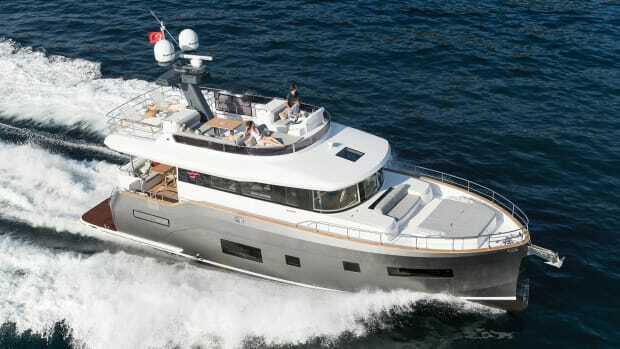 Though she is luxurious, the Seventy8 draws on that sailing heritage to be an efficient passagemaker, though Hull No. 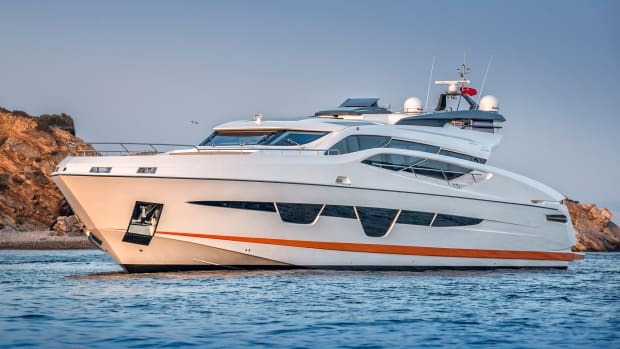 1 has the upgraded 580-horsepower John Deere diesels, she has a range of better than 5,000 nautical miles at 9 knots, according to her skipper, Capt. RyanSpence. 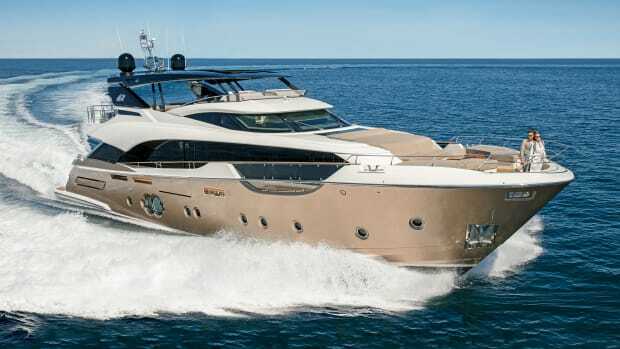 He should know, as he told us the crew was gearing up for an Atlantic crossing to bring the boat from her debut at Cannes to the Ft. Lauderdale International Boat Show. “We will be watching the weather, of course—we will use a router,” he said. “But it’s nice to know we will have 20 knots of speed if we need it.” And hopefully plenty of cookie dough in the freezer to fuel the journey.